This is an open-sided small minivan with front-to-back bench seating available for hire like a taxi. You'll find the main streets in any of Phuket's resorts lined with them waiting for a fare. They're not metered and you need to check the fare before you get in. In most cases, the fare will be higher than you'd expect and is almost certainly non-negotiable — although it is always worth a try at bargaining with a smile. 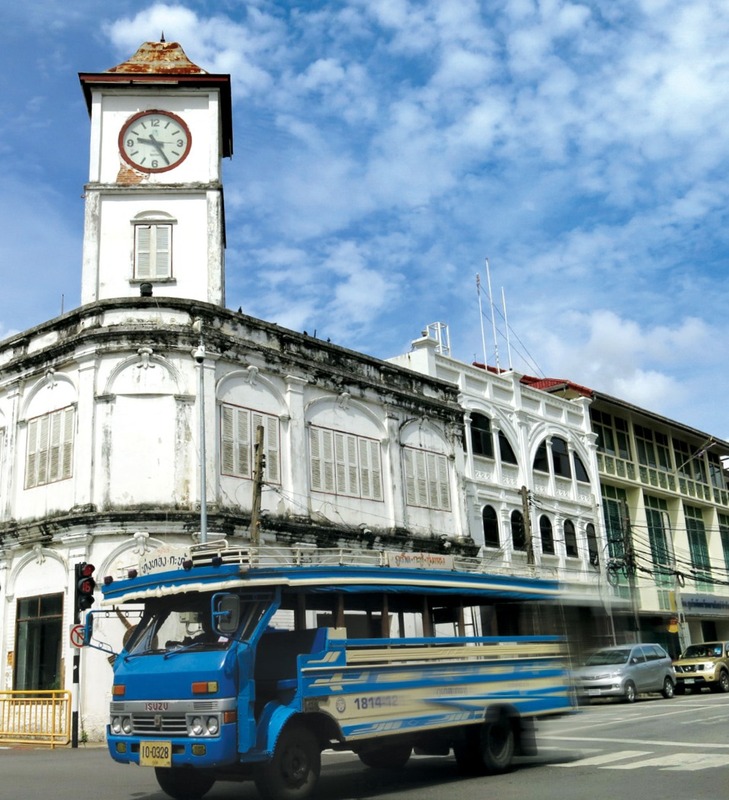 Phuket's tuk-tuk drivers are happy to wait all day for a fare at the right price and operate a closed shop so there is no effective competition. Under no circumstances get into an argument with a tuk-tuk driver about the fare or anything else; you're likely to find yourself arguing with a crowd of his friends too! 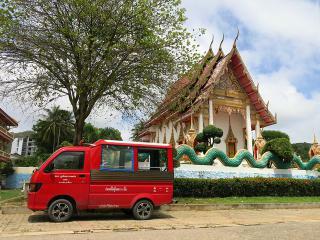 A tuk-tuk ride is not particularly comfortable or fast, but may be the best way to travel a short distance from your resort. The best way to start off is to ask at your resort information desk for an idea of how much to pay to get to your destination. CAUTION: If you're offered a really cheap ride in a tuk-tuk, you'll find yourself being taken around several retail establishments en route to your destination. The driver picks up a 'fee' for every tourist he brings in! Recently introduced to Phuket, meter taxis have been unable to break the tuk-tuk monopoly on pick-ups in major tourist spots. It is worth, though, obtaining a meter taxi phone number from your resort's information desk as you can call them for the return trip after a night out . You will probably need a Thai-speaking person to arrange the booking. The majority of public buses, plying only a few popular routes, are open-air vehicles of a style that has not changed for 50 years. Although locals will tell you there is a schedule, it's almost impossible to find out exactly what that is. If you're travelling from one major destination (eg Patong Beach, Kata Beach, Nai Harn Beach etc) to another (eg Phuket City) you can find out from your resort information desk where the bus pick-up point is and give it a try. You'll find most of your travelling companions will be locals, and this can be a great way to gain an insight into how things really work in Thailand. 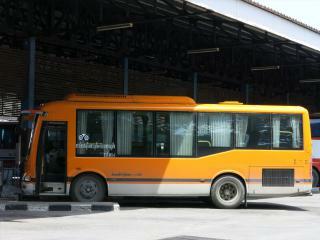 There are many private, unlicensed 'taxis' operating in Phuket. These will almost certainly be uninsured for carrying paying passengers. However, if the insurance aspect is not too important to you, many visitors find this the ideal way to go. If you do decide this is for you, get the information desk at your resort or the head waiter at a local restaurant to organise it for you and tell them you want a driver who speaks English. If it works out, you could find yourself with your own chauffeur — and a good friend — for the duration of your visit. For passengers arriving at and departing from Phuket International Airport, there is a private airport bus service on Phuket Island that offers an alternative to public buses, 'limousines' and taxis.